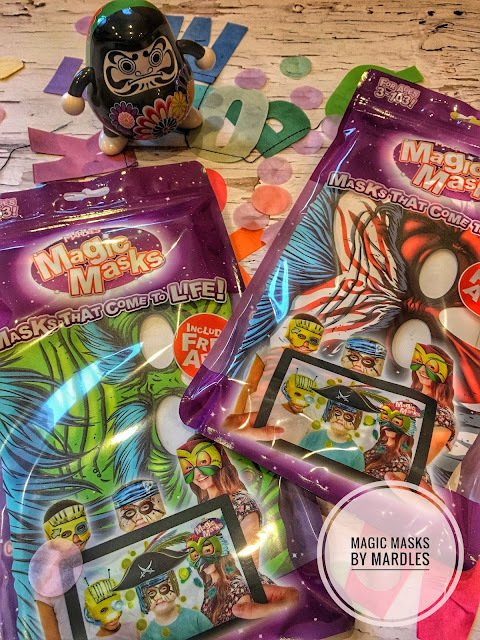 Today I want to introduce you to one amazing product I've discovered at the Blog On UK inside the goodie bags, something that left me totally amazed... the Magic Masks! The Magic Masks by Mardles are something that any children or adult would love to have this Halloween or at any party, or at least I would love to. The Magic Masks size is adjustable depending on the size of your little one and they are made with strong plastic to let you enjoy the mask for a long time. Of course the Magic Masks are recommended for children older than 3 years, but with little kids you always have to take care of what you give to them, I am sure you already know this! I suppose you are asking what has this mask different from the others... It can get more scary than you ever thought! It comes to live when you use your phone on it, you only have to download a little application (free) and then you have to look at your scary mask with it.. But be prepared, is scaring! This mask had been a blast, not only with my little one but how we enjoyed recording him, so much fun!